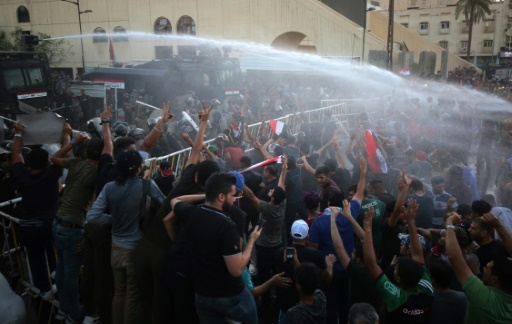 Baghdad (AFP) – Fresh protests hit southern Iraq Sunday as medical sources put at 11 the number of demonstrators killed in two weeks of unrest sparked by ire over corruption and lack of public services. Security forces remained deployed around the capital Baghdad after struggling Friday to disperse crowds of angry protesters who took to the streets. Demonstrations have roiled swathes of southern and central Iraq since erupting in the oil-rich port city of Basra on July 8, when security forces opened fire killing one person. Overall medical sources put the death toll in the unrest at 11 people, three in each of the cities Basra, Samawah and Najaf, and one in both the cities of Diwaniyah and Karbala. Most of them were killed by gunfire from unidentified assailants, while one person suffocated to death on tear gas used to disperse the demonstrators. Protesters on Sunday took to the streets in the cities of Samawah and Nasiriyah, chanting “no to corruption”, a scourge Iraqis say has long blighted their country. Since the start of the demonstrations those involved have focused their anger on the political establishment, with government buildings and party offices being sacked or set ablaze. The Iraqi authorities have scrambled to halt the unrest and have blocked social media sites online to try to prevent the spread of protests. Iraq is in a state of political limbo with Prime Minister Haider al-Abadi overseeing a caretaker government as wrangling to form a new government drags on after elections in May. A coalition headed by populist cleric Moqtada Sadr topped the polls, campaigning on an anti-graft ticket to claim the most seats in parliament. Featured Photo: AFP / AHMAD AL-RUBAYE. Iraqi security forces use water cannons to disperse protesters in the capital Baghdad’s Tahrir Square on July 20, 2018.